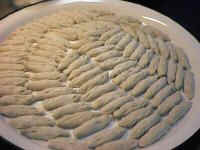 However many of us know this famous traditional Chechen food as "Galnish" , there are someother callings like "Djird-Galnish" , "Djirdigish" , "Jijig Galnish" , etc. 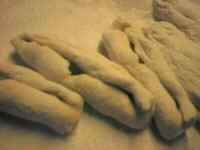 But as I learned from my father that "Gal" is the name of the dough piece which is in nearly cylinder shape with 5-7 cm long . 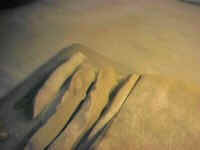 After the process you made on the "Gal" like shown in pictures 31 , 32 , 33 , 34 , 35 it becomes a "Djird-Gal" . The name "Djird" is called because its similar in pronouncation to the sound you hear while you are hitting the fork on the "Djird-Gal" after it has cooked . 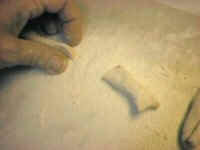 The "Djird-Gal" is called for only one processed dough piece . 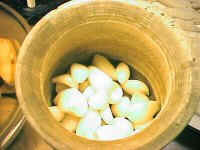 When its plural , like when its ready to be eaten (picture56) , its name becomes "Djird-Galnish" . We mostly call in our family as "Djirdigish" which is in the same meaning as "Djird-Galnish" . 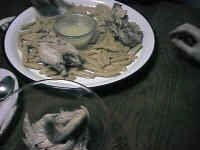 We (my family) mostly use Quotom Jijig (chicken meat) while cooking "Djirdigish" . You can also use the red meat . 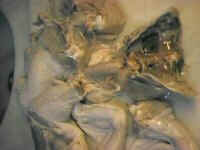 The same processes has to be done like you did to the chicken meat . 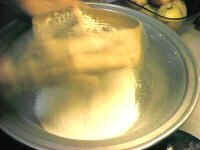 "Djirdigish" has a souce which is composed of garlic and the juice that you cook the meat and the Djirdgish's in . This souce has many types . Someone should have to prepare another page explaining all about it . I tried to explain the souce which is mostly known . 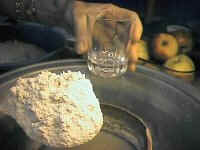 The souce is called as "Bieerem" in Chechen language . 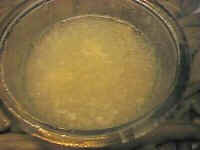 And the soup (the water becomes soup after you boil the meat and the Djirdish in it) called "Chorp" . While or after you eat Djirdigish you have to drink a cup of "Chorp" at least . 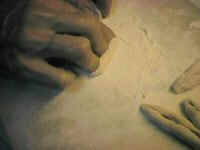 Its better to do . 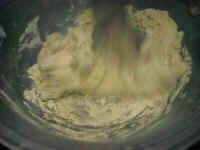 You can also add some souce , black pepper , lemon juice in to the Chorp . Its up to your taste . 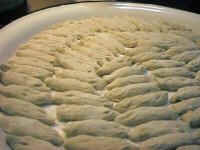 There are many many stories about this famous traditional Chechen food . I want to explain only one here . I bet you have many other . 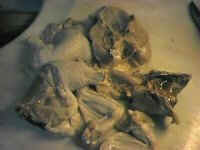 The chicken is cut into pieces from its joint points and then washed . If you decide to do with meat the process is the same . 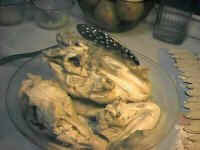 The amount of the chicken or meat is up to you . Depands on how much you eat . Here we are doing with only one chicken . 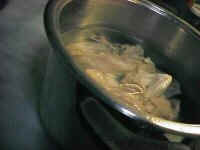 Then put the pieces into a big saucepan . Put water that can cover the chicken pieces easily . That refers to 3/4 of the saucepan as I noticed . Also add some salt ( 1 full soop-spoon ) . 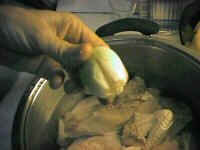 Then put an onion which is half-cut from its bottom in order to make the chicken more delicious (pic05) . 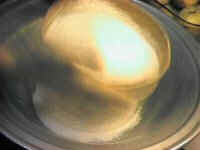 Then put the saucepan on the fire which is not very strong . 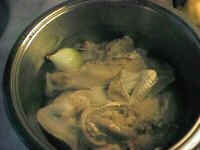 All we want to do is to cook the meat , chicken by boiling method . When the chicken is boiling up it makes a foam like something on the water . This foam has to be taken out with help of a big cooking spoon . 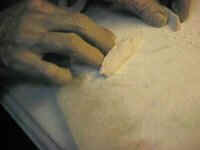 While we leave the chicken to boiling we better start preparing the dough . 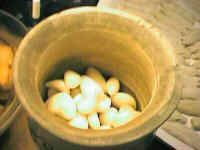 While preparing the dough someone better cleans the garlic and collects it in a cup (pic07-pic08) . My sister does that usually . 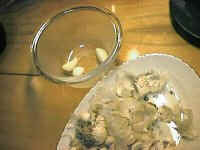 And in the further steps the garlic is going to be crushed in order to be used while prepring the souce . 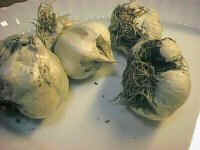 I crush the garlic usually at home :) (pic41-pic42,pic43) . The garlics should be crushed in the same time with the 46th picture . 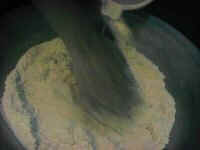 The flour is important . It changes the taste of the Djirdigish . 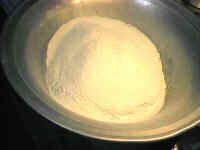 We use a type of flour which we have from our village . Its not like the ones that they sell in the markets . 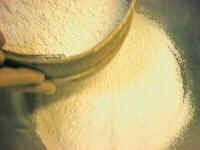 The ones who cannot find the village made flour better use the flour thats used in making cakes . 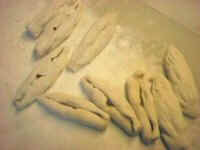 But its ok also if you make it with the normal snow-while flour . 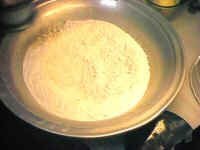 The amount of the flour is proportional with the number of people who is going to eat . 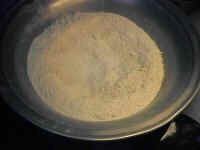 My mother usually puts one cooking spoon or one glass of flour for one person (pic09) . 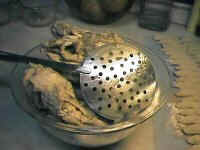 Then with the help of a fine sieve filter the flour . 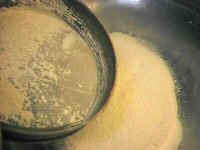 Again add some salt (pic10...pic16) . The amount of salt is up to your decision . 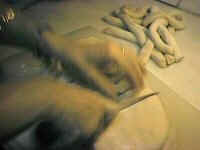 In the picture 17 and 18 you can see the preparation of the dough . 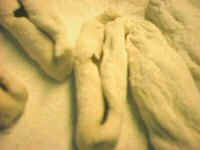 The dough musnt be like so soft or hard . 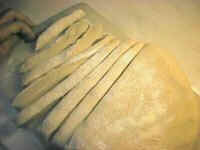 Then the shape in the picture 21 must be given to the dough . 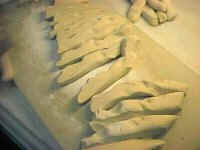 Then by help of a knife cut the dough in to the pieces like in pictures 22 , 23 , 27. 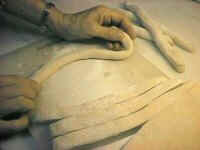 By rolling the cut dough tape under two hands like in picture 25 give a cylindirical shape to the dough (pic30) . 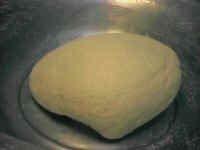 The radius of the cylindirical dough piece is 1.0 - 1.5 cm . 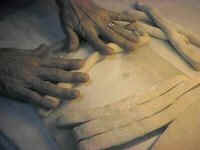 Then , by help of hand or knife , break off or cut off a piece which is in 4 - 5 cm long (pic36) . 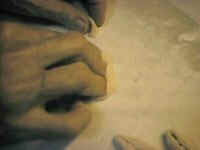 Continue preparing Djird's as explained until the dough has finished . 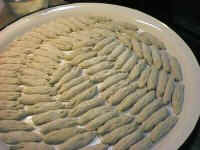 After you make each Djirdig put them in to order in a tray like in pictures 37 , 38 , 39 , 40 . 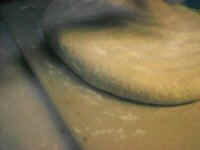 The trays should be also covered with flour . 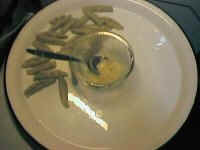 At the same time , when the chicken is cooked take them off from the saucepan to a cup like in pictures 44 , 45 . Then someone better start crashing the garlic while the other puts the Djirdig's into the saucepan to boil them up . 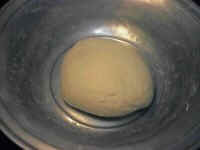 Before crushing the garlics again put some salt into the crushing cup (pic41,pic42) . The salt will make it easier the crushing . 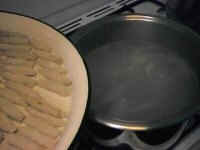 Putting the Djirdigs into the saucepan like in picture 47 and 48 should be done slowly and seperetaly . 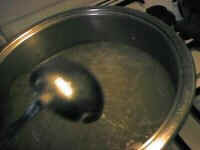 We shouldnt fill the saucepan so much with Djirdigs . 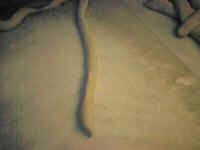 Otherwise the Djirdigs may stick together . 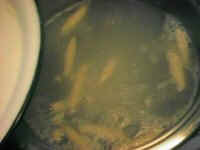 After the soupy water starts boiling we should wait the Djirdigs to be cooked . 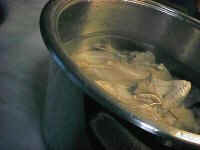 This process takes approaximately 2 or 3 minutes after boiling starts . 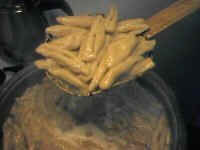 Then when you agree that the Djirdigs are done take them off into the tray like in picture 51 and 52 . Put the crashed garlic cup at the middle of the tray . 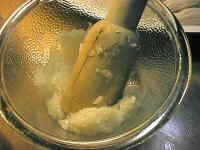 To make the garlic cup a souce cup take some oily soup from the saucepan by the help of cooking spoon and put it into the crashed garlic cup like in pictures 54 and 55 . Picture 55 is a ready souce cup now . After you take off all the Djirdigs into the tray you can now put the chicken pieces . 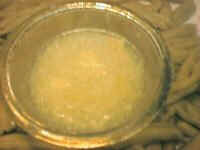 A ready Djirdigish tray is like in picture 56 . Now , all you have to do is to take your self a sharp long nailed fork to eat the Djirdigish . 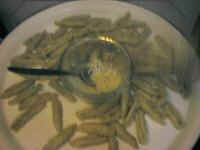 Take 1 , 2 or 3 Djirdigs to your fork , dip it into the garlic souce "Bieerem" , then without anytime loss eat it . You can eat the chicken with Djirdigish . Djirdigish should be served as quick as its taken out from the saucepan . Then , if you done everything correctly , dont forget to call me :) I am ready to eat Djirdigish anytime .